Feed your teeth’s divine design with a tooth powder than brightens and whitens. This mineralizing tooth powder polish shines your teeth to mint condition. 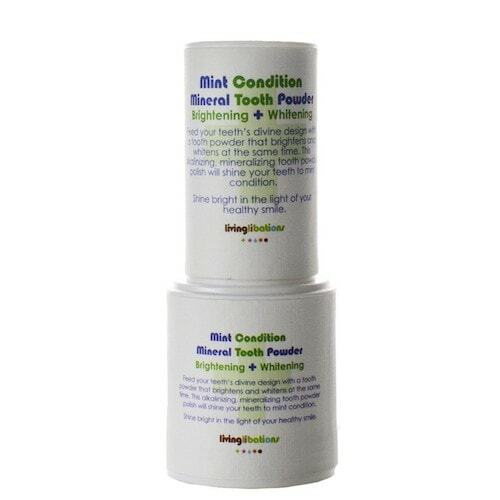 Mint Condition Mineral Tooth Powder is a gentle exfoliating elixir that polishes teeth with the pure ingredients of kaolin clay, coconut MCT powder, baking soda, magnesium, calcium, sea salt, probiotics, vitamin D, peppermint, and spearmint to harmonize optimal oral ecology. Alkalinize and brighten your pearly whites with a tooth polish earthed from nature. Some whitening products use bleaching agents that can be too harsh for the enamel. This gentle botanical brightener nourishes enamel with bio-available minerals. As you polish, tiny mineral particulates are delivered to the teeth and saliva. Shine bright in the light of your healthy smile. Place a pinch of Mint Condition Mineral Tooth Powder on a dry toothbrush or boost your protocol by adding a drop of a Living Libations dental serum: Yogi or Happy Gum Drops or Mint + Myrrh for an extra burst of fresh, plaque busting power. Tip: Add a pinch to an ounce of water and swish, swish, swish after brushing to neutralize acid between brushing. Tip: For an even more invigorating impact, follow our Eight Steps for Successful Self-Dentistry and follow with one of our Swishing Serums for an effective oil-pulling program. Some whitening products use bleaching agents that can damage the enamel. This gentle botanical brightener nourishes enamel with bioavailable minerals. Kaolin Clay (Kaolinite) – Quality kaolin clay is a silica rich remedy. Our ancestors deemed that this dirt worked brilliantly for dental care. Clays essentially function as a magnet; when clay is mixed with saliva, molecules are electrically activated and pull out micro-particles of toxins and impurities. It gently and effectively exfoliates without being harsh on enamel. Coconut MCT Powder (Cocos nucifera) – This powdered lipid serves as a lubricant in this polish for sensitive teeth, and it also adds nutrients. MCT powder is a dried, powdered form of medium-chain triglycerides. Organic, unrefined coconut naturally contains both medium chain triglycerides (MCTs) and long chain triglycerides (LCTs). The MCT, including caproic, caprylic, and capric acids, are extracted to create a concentrated oil with all the beneficial compounds of coconut oil. It takes about 20 tablespoons of ordinary coconut oil to make one tablespoon of a coconut oil based MCT oil. MCT oil abounds with beneficial nutrients for the mouth, body, and brain. Baking Soda (sodium bicarbonate) – Beneficial baking soda is a naturally occurring alkali substance produced by our bodies. It is also found in mineral deposits in the earth and dissolved in mineral springs. Beyond its green-cleaning capacity, baking soda also befits the body. Alkalinizer extraordinaire, baking soda shines as a toothpaste and an effective tooth cleaning polish while its alkaline-action helps to eliminate biofilms, reduces oral acidity levels, neutralizes pathogens, and naturally whitens teeth. It is significantly less abrasive than cleaning agents, chalk and silica, used in commercial toothpastes. Dr. Paul H. Keyes D.D.S., clinical investigator at the National Institute of Dental Research, advised regular brushing with sea salt and/or baking soda to prevent destructive periodontal disease. Calcium from Lithothamnium calcareum – The quality calcium in our powder polish is 100% certified organic and made from the marine plant, red algae, that grows around the North West coast of Iceland. This special marine plant spends its five year life span absorbing minerals from the Atlantic waters and contains 34% elemental calcium and 72 other trace minerals. Mature plants naturally settle on the sea bed where it is sustainably harvested and taken ashore to be rinsed, dried, and powderized. Nothing else is added. This is contaminent-free, clean-sourced vegan calcium that is not from limestone, chalk, animal bones, coral, shell, nor dairy. Itis harvested in Iceland under strict ISO 9001-2000 certification. It is organic, kosher, Halal Certified, and GRAS. Magnesium (Magnesium hydroxide) – Mighty magnesium is naturally marine-sourced from the clean, mineral-rich seawater off the Irish Atlantic coast. It is created when calcium oxide reacts to the magnesium in the seawater, which precipitates magnesium hydroxide. This elemental magnesium is washed repeatedly with fresh water, dried, and crumbled to a fine, high-grade magnesium hydroxide powder. This form of magnesium is highly soluble and maximizes a multi-mineral matrix of 74 pure plant-source and trace minerals that work synergistically to boost bioavailability. Sea Salt (Sodium Chloride) – Oceanic salt is an alkaline ally for our oral ecology as it contains the same concentration of minerals as seawater. It is plentiful in minerals essential to intracellular communication: magnesium, calcium, sodium, potassium, and trace minerals. Probiotics (L. plantarum, B. bifidum, and B. longum) – Boost the body’s beneficial bacterial-bank account by polishing it up with probiotics. Studies show that topical application of probiotics rebuilds microbial diversity. These probiotic strains have an established shelf life of two years without refrigeration, and they are vegan, gluten-free, and dairy-free. Vitamin D3 (Cholecalciferol) – Vital vitamin D3 is a fat-soluble nutrient known to be a best buddy for calcium as it regulates calcium levels to boost bone health. Peppermint (Mentha piperita) – Bursting with minty freshness and powerful plant properties, peppermint’s cooling qualities are key in this essential oil’s ability to pacify throbs, reduce redness, and grace the gums with goodness. All the rage in Europe, by the end of the 19th century peppermint was (and is) much more than a mere breath freshener. The name “mint” derives from the Latin mente, meaning thought, as our ancestors considered mint a boost for the brain. It is known to ease headaches, clear sinuses, improve digestion, and be victorious against a variety of viruses. Peppermint feels cooling and nice like ice, and it is, therefore, the freshest of all the breath fresheners. Spearmint (Mentha spicata) – Sprightly spearmint is peppermint’s softer, more understated, cousin. Fresh, fragrant spearmint soothes the senses with whispers of minty magnificence! It has been offered throughout history to treat all manner of ailments, including indigestion, headaches, and respiratory infections. The ancient Greeks chose spearmint to treat infections and scent their bath water, while medieval doctors prescribed the herb to freshen breath, whiten teeth, and soothe sore, swollen gums. Native Americans used spearmint to increase appetites and bolster oral care. Spearmint is a powerful antibacterial agent; in a 2001 study conducted by H. Imai, spearmint effectively inhibited the growth of different bacterium, including MRSA and E. coli.